Skeletal tuberculosis (TB) is commonly seen in South Africa, especially in the immune-compromised patient group. The thoracic and lumbar spine are commonly affected and the decision-making around pathology in that area has become easier based on experience gained in, especially, government institutions. The danger occurs when atypical sites of infection occur and the associated structures and pathology thereof are not thoroughly considered and investigated. A case is reported which highlights the potential pitfalls of tuberculosis of the skull. The associated cranio-cervical pathology appears very similar to meningitis and subtle changes on imaging in that area is often difficult to assess and easily missed. There are several management options based on individual presentation. Medical management remains the same as for all other skeletal TB. A 5-year-old patient, previously well, presented to a rural hospital with a fluctuant mass over the right frontal area. A clinical diagnosis of a scalp abscess was made and subsequently incised and drained. Pus was sent for microscopy, culture and sensitivity (MC/S) and she received a full course of antibiotics. The abscess recurred at the same site after a month and was drained again. On both occasions the MC/S was negative and she received oral antibiotics. On her third presentation two months later she had two ulcerated lesions on her head, one in the right frontal area corresponding to the site of the previous incision and drainage and a second one in the left parieto-occipital area. Both wounds were discharging serosanguinous fluid. 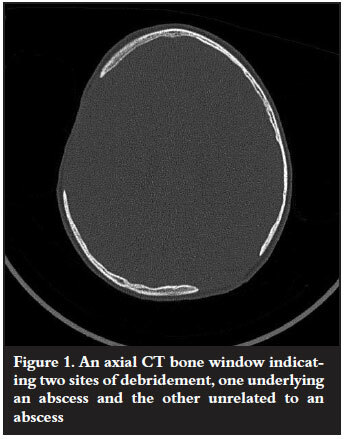 A CT scan of the brain revealed right frontal and left parieto-occipital osteitis of the calvarium with an underlying extradural collection that was assumed to be an empyema, and she was referred to a tertiary institute. The patient presented at the emergency department drowsy and disorientated with two scalp ulcers overlying exposed bone. She was otherwise haemodynamically stable and had no fever or neck stiffness. Blood tests suggested an acute infection on the background of anaemia of chronic disease. At emergency surgery, the osteitis was found to extend far beyond the exposed area. The ulcers were excised, all osteitic bone debrided and the empyema drained (Figure 1). Tissue samples and swabs were sent for routine MC/S and TB MC/S. Post-operatively she was started on empiric intravenous antibiotics and improved clinically. There was no organism isolated on any of the specimens sent. On the fifth post-operative day she developed severe neck stiffness but remained apyrexial and clinically stable. A follow-up CT brain was ordered. There was no intracranial collection or mass lesion reported. Histological results demonstrated granulomatous inflammation consistent with tuberculosis. A diagnosis of TB osteitis of the skull and associated TB meningitis was made and antituberculous therapy was initiated according to the national protocol with marked clinical improvement. She was discharged home well 2 weeks after admission. At her 3-month follow-up her wounds were completely healed. She was compliant on her the TB treatment. She was neurologically intact but complained of severe neck spasm and decreased range of movement. 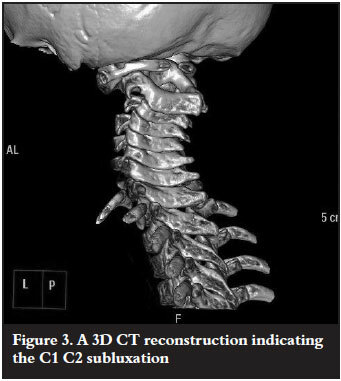 C-spine X-rays revealed a C1 C2 subluxation with an ADI of 9.0 mm confirmed on a subsequent CT scan (Figure 2 and 3). 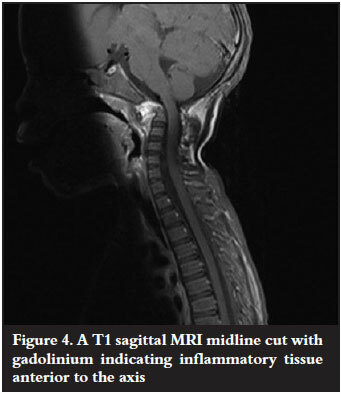 MRI study confirmed the diagnosis of Grisel's syndrome with an inflammatory mass anterior to the axis, erosion of the dens and atlantoaxial subluxation (Figure 4). The spinal canal was compromised, but the spinal cord was free with residual CSF around the cord and no signal changes in the spinal cord. The patient was treated with traction until a posterior C0 to C2 in situ onlay fusion was performed. The surgery was uncomplicated and she was discharged day 5 post surgery with a Philadelphia collar. At 3-month follow-up there was good bony fusion noted and she was clinically well. She was advised to use the collar during the day only and to continue the antituberculous therapy with further follow-up scheduled. Initial radiographic findings are generally inconclusive with no obvious thickening or widening of the soft tissue shadow.8 Late changes can include joint subluxation and destruction.8 The granulomatous process usually affects the ligamentous structures maintaining the C1-C2 structure integrity.7 MRI is very sensitive in detecting the associated deformities in atlantoaxial tuberculosis. As a result of the increased incidence of HIV in tuberculosisendemic regions, there has been an increase in the presentation of atypical skeletal tuberculosis. Atlantoaxial tuberculosis is rare and if diagnosis is delayed can have disastrous consequences for the patient. A high index of suspicion is needed when patients present with neck pain and associated pulmonary TB. This case highlights the need to keep associated structures in mind when dealing with atypical sites of TB infection. 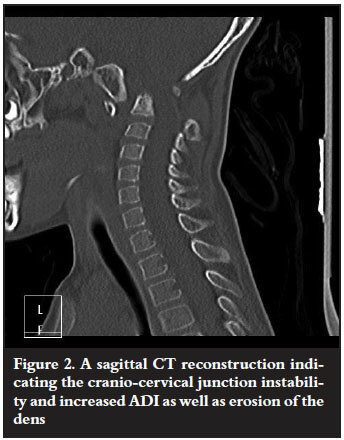 Cranio-cervical pathology can present with severe neck stiffness mimicking meningitis and pure ligamentous involvement is easily missed on routine cervical spine X-rays. No commercial benefits were or will be derived from this paper.